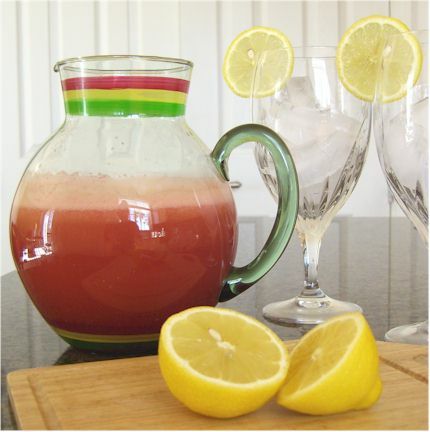 Okay, so this week I had a guest post over at Zesty Cook; to beat the dog days of summer, I whipped up a big pitcher of Watermelon Lemonade! I seem to be in a bit of a watermelon frenzy, since it is on for such a great price, and since it is so darn refreshing. Is it hot where you live? It is REALLY hot here in the SouthWest. Even wimpy blenders will puree watermelon with no added liquids and a little coaxing. So puree the rest of that bright red flesh, pour it into an ice cube tray, and freeze. You can pop one of these out when you need a simple refreshing treat, to make smoothies, or to simply pop in your beverage for some delicious watermelon flavor. 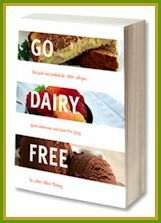 This recipe is naturally Vegan, Dairy-Free, Egg-Free, Gluten-Free, Nut-Free, Soy-Free, and Fat-Free. It is also free from Refined Sugars. Place the watermelon, lemon juice, agave, and water in your blender and puree until liquefied and smooth. Fill two large glasses with ice to serve. Garnish with lemon wedges or slices if desired. 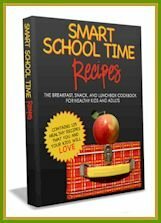 Blog Events: This recipe has been submitted to Fight Back Fridays. I received tons of awesome book recommendations from all of you! My wish list is growing. At least a few of the clothing items I ordered fit … okay, not most, but at least a few! I think I am destined to live in fitness wear. Mmmm, I just devoured two yummy Orange-Oat Muffins from Ricky’s book Sweet Freedom. More on that to come. I balanced all of our books, did the quarterly reports, etc, etc, etc … whew major two day project! Blue skies and bright sunshine every day this week. How can I complain about that? This Inquiring Mind Wants to Know – What Foodie / Health Books Do You Recommend? Keep us apprised of what books you end up reading! I love your lemonade. So refreshing with the lemonade. mmm sounds so good!! i am intrigued by the idea of using fresh fruit to make lemonade (besides lemons). This would make a great drink for a BBQ as a featured drink. I agree with watermelon being so cheap…why not? Yum! It looks refreshing! Plus I love the watermelon cubes!! I have way too much watermelon in the fridge. This’ll be perfect, thanks! This sounds so refreshing. Now, if the temperature would just get out of the 60s, I might grab a watermelon and make some! This looks so cold and refreshing! 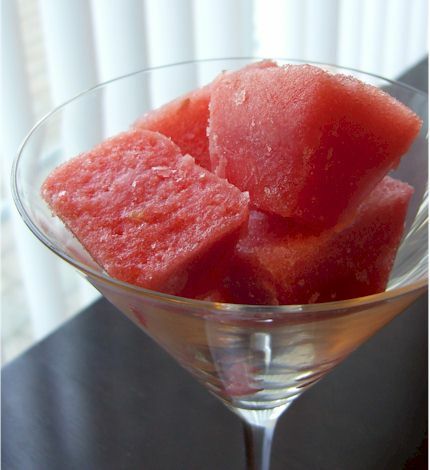 I so love watermelon and like you–it is hard to use a a whole one for me but making great drinks like this helps. I love the ice cube idea too!